Mix cornstarch and sugar together. Sprinkle about 1/3 of the mixture over the bottom of the pie shell. 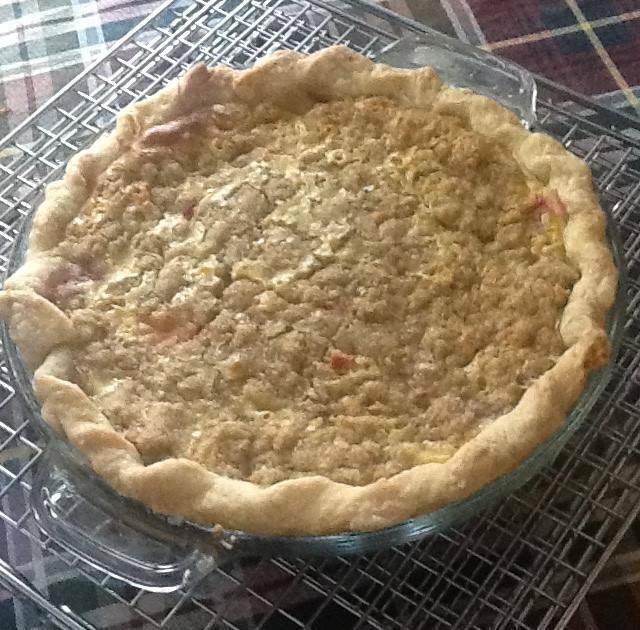 Mix the rest with the rhubarb and pour carefully into the pie shell. Roll out the top crust and, if desired, brush with cream or egg wash and sprinkle with coarse sugar. Gently pat the edge of the bottom crust with water and place the top crust over the filling. Press around the edge and flute or press with a fork. Bake at 400 degrees on lower rack for about 20 minutes and lower the temperature to 350 degrees for about 1 hour or until the crust is golden brown and you can see the filling bubbling in the middle of the pie. Put flour in large bowl, add salt and sugar, if using. Add about 1/3 of the ice water and toss gently with fingers until the mixture begins to stick together. If it is too dry, add more water, about 1 tbsp. at a time until a soft ball begins to form. At this point, the dough appears to be a bit ‘raggedy’, but just divide it into 2 pieces, one a bit bigger than the other. The larger one will be for the bottom crust. Form each piece into a round, flat disc. Sprinkle the counter liberally with flour and turn the pastry frequently to make sure both sides are covered with flour. Roll out evenly. Fold dough in half and place carefully into a pie plate, making sure not to stretch the dough. If you are going to use a pre-baked crust, you will need to ‘blind-bake’ the crust. Do this by pricking the bottom crust all over with a fork. Flute the edges. Line the crust with parchment or foil and place pie weights or dried beans into the liner to hold the crust in place. Bake at 375 degrees for about 10-12 minutes or until the outside rim of the crust is beginning to brown. Remove the liner carefully and place the shell back in the oven for another 10- 15 minutes or until the bottom of the shell is golden brown. Cool on a rack and add the desired filling.